The Natural Heritage Resort is nestled among the hills of Madhya Pradesh, near the Bandhavgarh National Park. 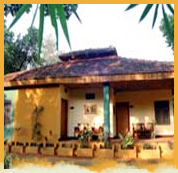 The Resort has luxury cottages with attached baths and a set in the midst of 3 acres of mature forest. Each cottage has a verandah looking out into the forest. Activities here include nature walks, elephant Safaries, slide shows and lectures by naturalists every evening. Located at the edge of Bandhavgarh Tiger Reserve, the nearest airport being Khajuraho ( 280 km) and Jabalpur ( 210 km). Accepted Cards : AMEX, VISA and MasterCard. Address : 181, Tala Bandhavgarh, Madhya Pradesh.